Saladin (1137-1192) - Learn all about this famous and powerful Islamic hero of the Crusades, who reunited the Muslim factions and took the Kingdom of Jerusalem from the Christian Crusaders, and who was admired and respected by everyone, including his enemies. Designed for high school World History students, this ten-page workbook is full of a variety of questions and activities. 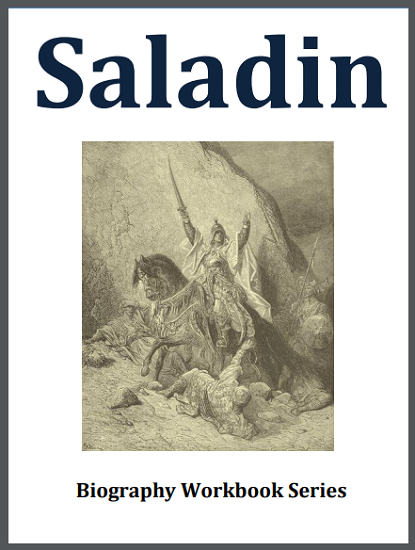 "Saladin" is part of our Biography Workbooks series. Click here to print. The answer key is below. Answer Key - 1. Yussuf ibn Ayub (Joseph the Son of Job); 2. B - Kurd; 3. Fatimid; 4. Abbasid; 5. Shawer; 6. D - Shirkoh; 7. Amaury and Nûr-ed-Din; 8. Answers will vary; 9. B - False; 10. Answers will vary; 11. Reunion of Islam and destruction of the Christian kingdom of Jerusalem; 12. Answers will vary; 13. L - successor; 14. K - substitution; 15. H - opposition; 16. A - antagonist; 17. J - spectacle;18. I - orthodoxy; 19. D - despot; 20. F - ignoble; 21. E - disastrous; 22. M - tedious; 23. B - chivalry; 24. G - interminable; 25. C - consolidation.